Meso isomers have an internal plane of symmetry, which arises from 2 identically substituted but oppositely oriented stereogenic centres. (By “oppositely oriented”, I mean the stereochemical orientation as defined by the Cahn-Ingold-Prelog priority system. For example, in a meso isomer with 2 tetrahedral stereogenic centres, one stereogenic centre needs to be “R”, and the other stereogenic centre needs to be “S”. ) This symmetry results in the superimposability of a meso isomer’s mirror image. By definition, a meso isomer and an enantiomer from the same stereoisomer are a pair of diastereomers. Having at least 2 stereogenic centres is a necessary but not sufficient condition for a molecule to have meso isomers. Recall that a molecule with tetrahedral stereogenic centres has at most stereoisomers; such a molecule would have less than stereoisomers if it has meso isomers. 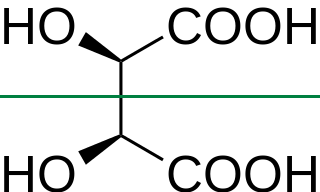 Meso isomers are also called meso compounds. Image courtesy of Project Osprey from Wikimedia (with a slight modification).